● Self-Declaration of Income Proof. Land rights, equity in development resource flows and life-enhancing epistemologies were among the themes emphasized by churches and faith-based organisations at the World Social Forum (WSF) held in Montreal, Canada from 09-14 August 2016. 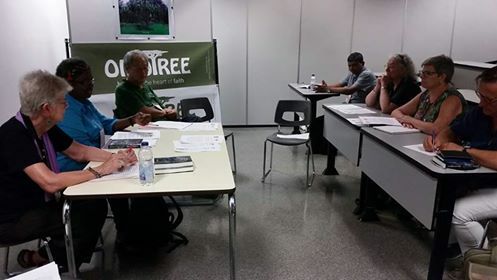 “Land creates an ecology of life…It is about relationships”, reflected Bishop Mark McDonald, World Council of Churches (WCC) President for North America, in an event titled “Listen to the the Land” organized by the Oikotree movement at the WSF. “However, the way land is understood in Western thought is completely hostile to the indigenous understanding of land.” For Indigenous peoples, the concept of land stewardship rather than ownership is recognized. The Oikotree movement is a faith-based network of movements and organizations striving for justice in the economy and the Earth initiated by the WCC, World Communion of Reformed Churches and Council for World Mission. “As part of the Pilgrimage of Justice and Peace, churches ought to accompany the struggles of movements for land and life. The World Social Forum – convened as an alternative to the World Economic Forum – is an important venue to do so,” said Athena Peralta, WCC Programme Executive for Economic and Ecological Justice. National Council of Churches in India expresses its grave concern over the vehement hate campaigns and brutal attacks on Dalits in different parts of India. We condemn the perpetrators, cow vigilante groups and the right wing fundamentalists who take the law in their hands and torment the Dalits in our country. Serious cognizance must be taken of the hate campaigns manifesting in their most recent forms such as the activities of ‘Cow-killers’ and restrictions sought to be imposed on ‘Cow-meat-eaters’. This is an extreme form of modern-day practice of untouchability and discrimination. We appeal to the Central and State Governments to ensure justice for Dalits without bias by maintaining the appropriate Law and Order to protect the vulnerable communities who are victimised in such hate campaigns. We are informed by the media that, the perpetrators are booked under public nuisance charges instead of taking legal action under SC&ST Prevention of Atrocities Act. Therefore, we urge the state governments to apply the SC&ST Prevention of Atrocities Act rightfully against the perpetrators in order to safeguard the constitutional rights that affirm life ‘OF’ all and life ‘FOR’ all. 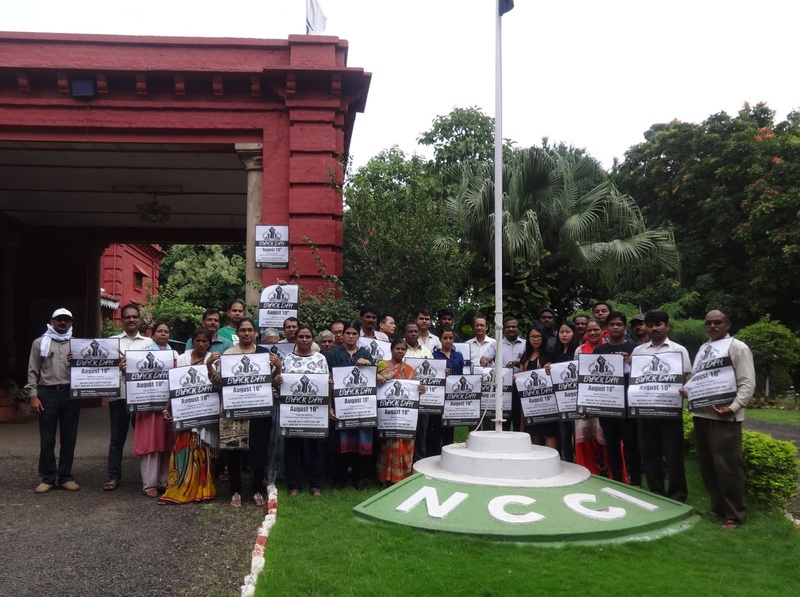 All NCCI Staff members observed “Black Day” on August 10, 2016 at the NCCI Campus, Nagpur to protest about the continual negligence of the government to the cry for the rights of Dalit Christians and Muslims in the country. In his address, Mr. Pradip Bansrior, Executive Secretary- Dalit and Tribal/ Adivasi Concerns, highlighted the injustice related to the issue and lamented that the Civil Writ Petition 180/2004 in the Honorable Supreme Court of India praying for the deletion of paragraph 3 of the Presidential Order 1950 has been pending in the Supreme Court of India for the past 12 years, since the Government has not yet replied to the Supreme court. The infamous Presidential (Scheduled Caste) Order 1950 was signed on 10th August 1950 by the then President of India, which says “No person who professes a religion other than Hinduism shall be deemed to be a member of the scheduled caste”. It was later amended to include Sikhs (1956) and Buddhists (1990) in the Scheduled Caste net. But this law has continued to keep Dalit Muslims and Dalit Christians out of the Scheduled Caste list. The NCCI Staff members along with the Secretaries assembled in front of the NCCI Secretariat, with black ribbons pinned on their chests/shoulders and held Black Day posters in their hands as a mark of protest. Rev. Christopher Rajkumar hoisted a Black Flag as an affirmation of solidarity with the suffering Christians and Muslims of Scheduled caste origin. The protest came to a close with the word of prayer by Rev. Caesar David. A one-day workshop on Relevant (Diaconal) Mission for Youth under the theme “Youth for Peace” was held on 23rd July 2016, at Church of South India (CSI) Parish Hall, Aruppukkottai, Virudhunagar District, Tamilnadu. The Unity, Mission and Evangelism Unit and the Youth Unit of National Council of Churches in India (NCCI), the Commission on Conflict Transformation and Peace Building Program of United Evangelical Lutheran Churches in India (UELCI), Christian Service Agency (CSA) and Congregation Accompanied Reformed Diaconia In Action (CARDIA) and Dept. of Communication of CSI Diocese of Madurai and Ramnad jointly organized this workshop. More than 175 boys and girls from 10 grassroots congregations participated in this workshop. Rev. Vinolin Caleap, Director, Christian Education Department of the CSI-DMR welcomed the gathering. Rev. Jothinayagam, the Chairman of the Local Council inaugurated the Workshop. Mr. Kasta Dip, Director, India Peace Centre, gave greetings along with a call to the youth to be the ambassadors of peace in addressing the issues that ruin peace in our societies. Mr. Jianthaolung Gonmei, Executive Secretary - Youth, led the devotion on “Blessed are the Peace Makers” (Matthew 5:9). He emphasized three points: Peace Breakers, Peace Fakers, Peace Makers. He further challenged the youth to be effective instruments of peace in the society. Rev. R. Christopher Rajkumar, Executive Secretary - Justice, Peace and Creation, led a workshop on ‘Contextual Scanning' through various cross-learning activities. This session facilitated the participants to have a better understanding of their neighborhoods and what the injustices are that ruin peaceful and harmonious living of communities. Further he challenged the participants by asserting that since ‘youth are the heart’ of the church, we need to know our role and function. If we fail, the entire life of our church would be a failure. This session challenged and encouraged the youth to stand for justice and peace with love in action. Rev. Vinolin Caleap and Rev. Timothy Arulkumar jointly conducted an evaluation session. Rev. Ebenezer Joshua, Director, Communication Department of the CSI-DMR proposed the vote of thanks. Rev. Jothinayagam closed this workshop with a word of prayer and benediction. Ten pastors from different churches also graced this workshop with their presence and prayers. Christian Service Agency and CSI Diocese of Madurai – Ramnad. The National Council of Churches in India and the Church’s Auxiliary for Social Action has jointly initiated a pilot programme with four local congregations to address the climate justice issue, thereby accompanying them in their journey towards becoming ‘green congregations’. This programme is an outcome of the National Church Leaders’ Consultation on ‘Ecumenical Diaconia at the Grassroots’ held from 24 -26 August 2015 in Bangalore. Since there has been a long standing concern to strengthen churches in North India, the four local congregations belonging to NCCI Member churches come mainly from this region. The four congregations are part of the Church of North India (Amritsar Diocese), Gossner Evangelical Lutheran Church (Ranchi) Hindustani Covenant Church (Pune) and Methodist Church in India (Delhi Conference). In order to launch this programme, NCCI and CASA jointly organized a workshop for the responsible persons from the above mentioned churches on ‘Congregation Based Diaconia: Towards Climate Justice’ on 3 – 4 August 2016, at CNI Bhavan, Delhi, India. There were twenty participants including women, youth, lay and clergy from these four local congregations. They will constitute the nucleus of their own congregations in implementing the climate justice programme in their respective grass-roots contexts. This pilot programme aims at developing a mature understanding of Ecumenical Diaconia at the grassroots, and to evolve relevant diaconal and missional interventions at the local congregational level, addressing the issue of climate justice from devotional faith, theological, ministerial and missional perspectives, in the context of un-earth-friendly ‘growth’, ‘development’ and ‘globalization’ policies of the governments. The underlying principle is that of being responsible stewards of God’s ‘good’ creation. In the course of one year, the four local congregations will start a process and cultivate a life-style of becoming green communities of love, justice and inclusivity. They will thus be expected to become torch bearers for local congregations all over the country who will follow their example. Rev. Dr. Roger Gaikwad, Dr. Sushant Agrawal, Ms. Ruth Yamima Kachhap, Ms. Prita Samantaroy, Mr. Sanjiv Tigga, Ms. Ekta Lall and Rev. R. Christopher Rajkumar facilitated various sessions in this workshop.